I have to admit, I get a bit lost when it comes to summer dressing. I know I like girl stuff, but I wouldn't say I'm girly girly. I like a bit of edginess when I dress, even when it's just casual. Which is why I have fell in love with the shorts and sweater combo. Casual, but you can have a bit of fun- especially when the shorts are leather. It's also a great alternative to the crop top fashion. I don't know about you, but I much prefer flashing my legs, whilst covering up my top half. There was something about this outfit that I just loved. It was comfy yet it felt fun. A motif sweater made a statement whilst the touch of leather gave it just that added oomf to stop it being entirely boring. Also with this look, I feel it is OK to wear shorts even when our summer hasn't exactly been the warmest. I mean my top half will be nice and snug which will radiate down right? Let me know what your think of this look. 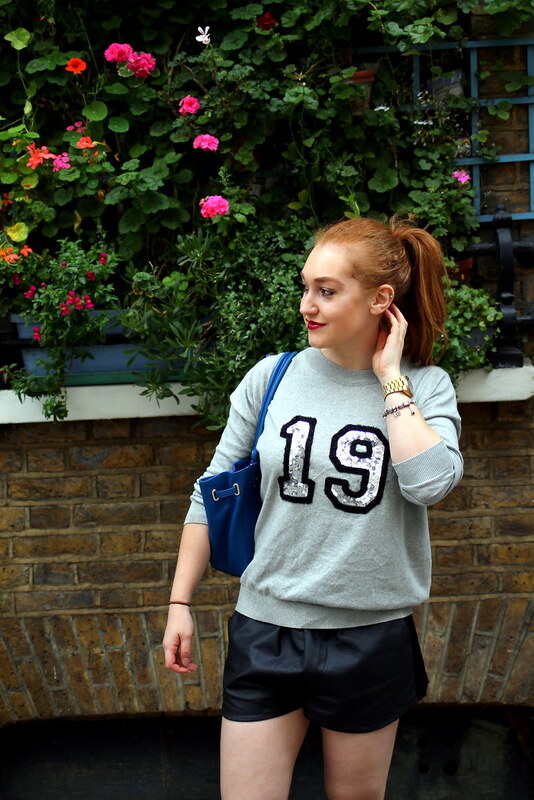 Are you loving leather shorts right now? Yes. Looks great. Think you should do a full feature on leather or latex. Or both. Love this, especially the pop of blue in the bag! Love the sweater! The leather shorts look fab but I don't think I am cool enough for those. fabulous sweater!! love your blog dear.